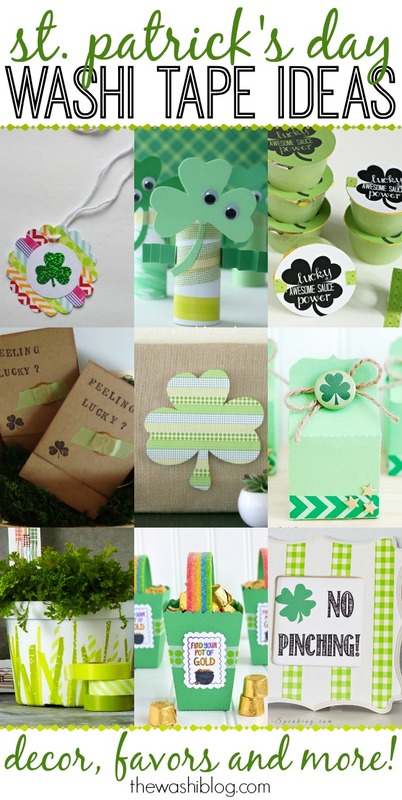 Don’t you just love ALL of those fab St. Patrick’s Day washi tape ideas?! If you grab some green washi tape, you really can make St. Patrick’s Day crafts out of anything! We hope these projects give you just the inspiration you need! Oh and REMEMBER if you have washi tape projects, be sure to SUBMIT them to be featured! We’d love to show off your work! What a fun round up! So thrilled to see my lucky lotto gifts included! Thanks for the inspiration, Keri! Thanks so much for featuring my washi necklace! All the projects are great! Thanks for the inspiration, Tashia! I have just recently discovered Washi tape ( and so have my kids which means I have to hide it), just wanted to say your blog is great and has given me a lot of inspiration! That’s fantastic, Heather! That’s what we’re here for! What great ideas! Thanks for sharing! I’m a new follower on bloglovin. Happy to have you, Ashley! Haha, that’s so fun, Marta!